10% growth in 2019? This indicator says so. This indicator is pointing to a red-hot property market. What does it mean? There’s been a lot of focus on the negative economic news stories in the past few months, but it’s always worth remembering that it’s never a one-way street. 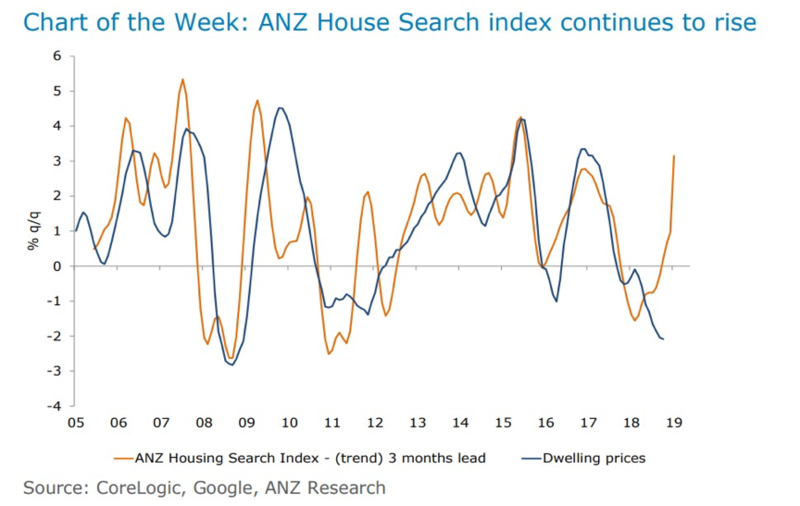 And if you want proof of that, take a look at the bullish picture emerging from the ANZ House Search Index, which has launched in recent months. 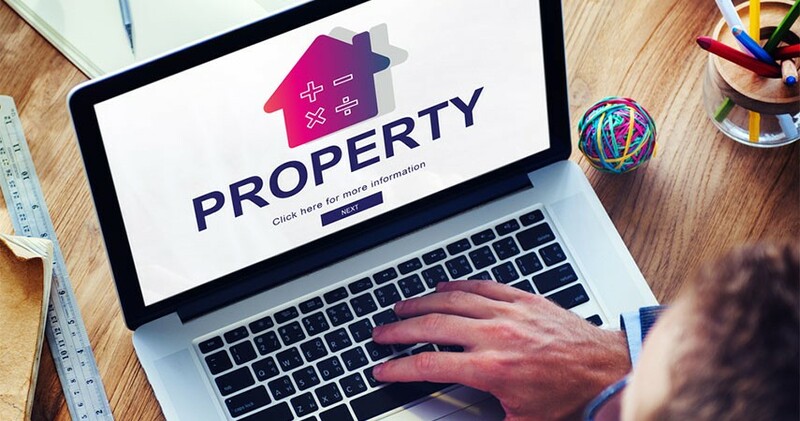 This tracks the number of searches on the main real estate platforms, and tends to predict house prices very well, leading them by about 3 months. So what are we saying here? House prices are about to boom? Are we going back to 2015 levels where house prices were growing at more than 10% a year? What about this 40% ‘crash’ everyone keeps talking about? It is curious. And to be honest, I am a little sceptical. I wouldn’t be hanging my hat on this given that the housing indicators are pretty mixed – they’re not telling a consistent story. Like auction clearance rates. They’re now down to 2012 levels, and certainly not suggesting that things are about to boom. ANZ, who publishes the data, is also a little puzzled. They do note that, apart from some of the housing indicators, all the signs of economic activity are pretty positive right now. Activity is strong, unemployment is low. Things are kicking along pretty well. Even some of the more stubborn indicators are coming to the party. For the first time in a long while, we’re starting to see wages strength, and people’s incomes are rising. 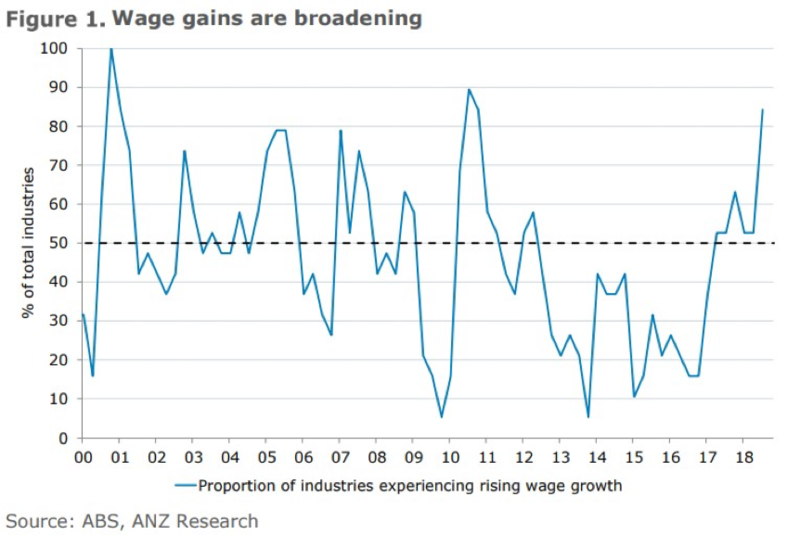 The number of industries where wages are rising is now at very strong levels. 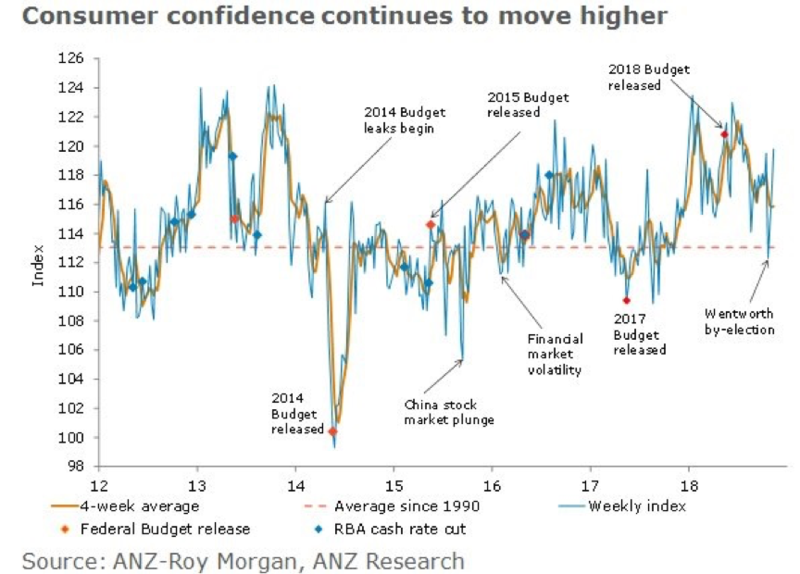 At the same time, and probably as a result, consumer confidence continues to move higher, with a sharp rebound after the Wentworth by-election caused a mini collapse. Looking at these things on their own, and the idea of booming house prices doesn’t seem like too much of a stretch. But 10% a year? Are we really going back there? I’m not so sure. My guess – and this is just a guess – is that a lot of this spike in search activity might be driven by the first home buyer segment. For years now we’ve been hearing stories of young buyers locked out of the market. Affordability is precisely the hot-button topic it is simply because people couldn’t afford to buy a house. And it’s been an issue for years. So what I think we’ve got is a growing pool of buyers waiting in the wings, waiting for an opportunity to get in. And then along comes the negative news stories. And look, it’s not all hype, prices are edging lower in most of the capital cities. Prices are softening. But I think what that means is that for our buyers waiting in the wings, suddenly there’s a sniff that they might be able to get into the market. And if you’ve been stuck on the sidelines for 5 years, you might be hitting the search platforms like crazy, trying to snare a bargain. So I think this is what the spike in search activity is about. So I don’t think it means we’re going to back to 10% pa growth. Not yet. But I think it does mean that this idea of a 40% crash or whatever is extremely unlikely. As soon as there are substantial falls of any measure in prices, then there will be buyers there waiting to snaffle up a bargain. A large pool of buyers. And so to me, that pool of buyers puts a floor under price falls. So I think we might see the market give up another 5% or so, but it’s hard for me to see it falling much further. And the search data suggests it’s practically impossible.